Whilst London’s appetite for restaurants in ultra-modern high rise buildings shows no signs of abating, it’s a pleasant surprise to come across an equally impressive venue that’s literally and figuratively ‘under the radar’. As its name suggests, The Old Brewery is actually housed in an old brewery! Located within the grounds of the Old Royal Navy College in Greenwich, diners have the pleasure of dining in one of London’s most picturesque locations. From the immaculately kept gardens to the imposing Cutty Sark and views across The Thames, there’s plenty to feast on before you have even walked into the restaurant. Once inside, there’s no abating of the visual drama. The site itself actually formed part of a brewery dating back to the 1700’s, but was largely replaced in the 1831 by the magnificent building that stands today. The building was taken over by London’s renowned Meantime Brewery back in 2008, who duly proceeded to restore some of its brewing heritage. Ostensibly the main purpose of the site is as a café by day and a restaurant/bar by night, but The Old Brewery also operates as a research facility for Meantime. 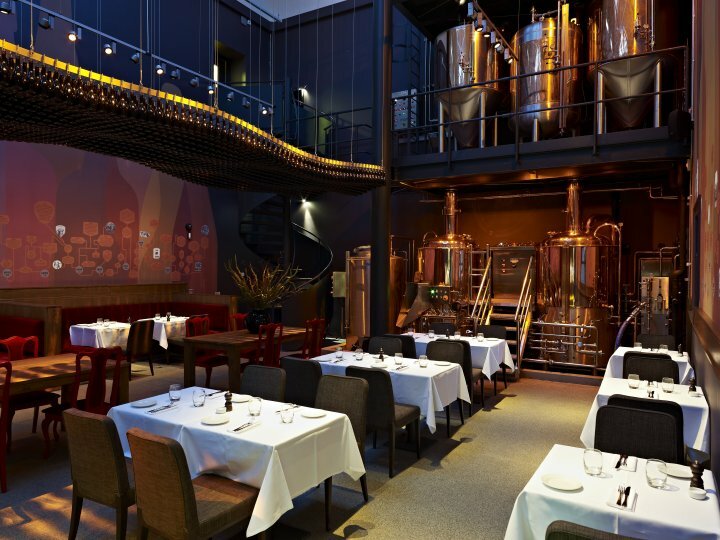 Diners sit amongst eight stunning 1000 litre copper clad vats that dominate the dining room and from here they can witness all of the activity that goes into producing the wonderful beers. It’s no surprise then that the beer at The Old Brewery is some of the freshest and finest around. The menu also embraces the venue’s brewing heritage by incorporating Meantime beer into many of the dishes, including Foie Gras terrine with beer chutney; Beer marinated ribs; and Cornish fish stew made with London Pale Ale. We’re not going to pretend that the food’s going to blow your socks off, but it’s certainly all hearty, delicious and of the standard you’d find in a good country pub; exactly what you want when dining in a temple to all things beer!